There are many ways to help Expanding Lives bring change to the girls of Benin and Niger. Expanding Lives is an all-volunteer 501(c)3 nonprofit, founded in 2007. The organization operates on global research that shows strengthening girls' education is the best return on a development dollar. Our resources help build skills in young women from Niger and Benin and allow them to determine how they will lead their community into the future. Everyone can spread the word about Expanding Lives' scholars and program. Check out our social media posts and tag us on Facebook, Twitter & Instagram! As an all-volunteer organization, 100% of donations directly support girls' education in West Africa. Please consider making a tax-deductible donation today either via mail or online. All of Expanding Lives classes are taught by volunteer teachers. Weekend outings are chaperoned and led by volunteers. Events and activities are planned by volunteers. Many people hold dinner parties for their friends and colleagues to educate them on the impact Expanding Lives is making in West Africa. Returned Peace Corps Volunteer Susan Susanke, along with Lynn Miller and Ryan Morris, held a dinner party near Washington, D.C. which raised more than $2,000. Gabby decided to forgo gifts for her 5th birthday and instead took donations for Expanding Lives. 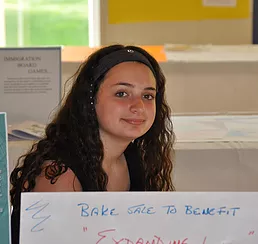 Devin raised awareness and funds while preparing for her Bat Mitzvah. Volunteers provide gift wrapping at Lincolnwood Mall. The troop collected 400+ items, school supplies & a laptop. Jennifer raised $1,000 by gathering donations to support her 15K race. Michael raised $1,300 via No-Shave November. He raised the largest amount of all the other 25 men growing beards for charity. Interested in hosting? Learn more & apply!